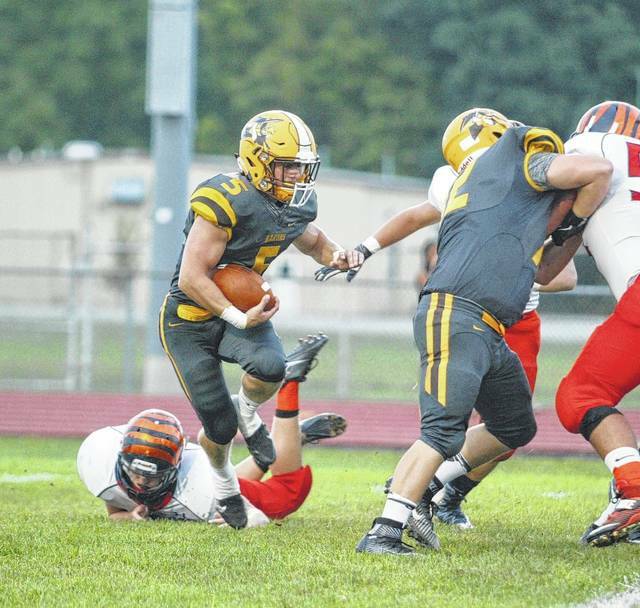 Buckeye Valley running back Trent Davies looks for running room in a game against visiting Galion last fall. It doesn’t matter if you play for Division III Buckeye Valley or defending D-I state champion Cincinnati St. Xavier. If you’re good, you’re good … and people are going to notice. Take BV senior running back Trent Davies for example. He’s good and, well, people are noticing. Not just any people, either … the Blue-Grey All-American Bowl selection committee. After solid showings in a handful of combines, Davies recently learned he’s earned a spot on the Blue squad. The game will be played at EverBank Field, home of the Jacksonville Jaguars, on Saturday Jan. 13, 2018 at 1 p.m. It’ll air live on ESPN3. Davies earned the selection by outshining a pool of nearly 7,000 players from around the country. He said he knew next to nothing about the Blue-Grey All-American Bowl when he received an invite to one of its regional combines back in May. That training showed in the final numbers. Of the 311 players who were invited to the Cincinnati combine, Davies finished first in the 40 (4.45 seconds), second in the broad jump (9-10) and second in the bench press (22 reps at 185). The scores from the combines, coupled with his high school highlight tape, landed Davies a spot in the showcase. Davies was unstoppable at times last season, his first at BV. He rushed 145 times for 880 yards and 14 touchdowns in nine games. He also had 27 receptions for 209 yards and three TDs. The 17 overall touchdowns accounted for 102 points — almost double the amount of anyone else on the team. Chris Santillan was second from a scoring standpoint, finishing with nine touchdowns for 56 points. Buckeye Valley coach Matt Stephens said it’s no accident, either. https://www.delgazette.com/wp-content/uploads/sites/40/2017/07/web1_davies.jpgBuckeye Valley running back Trent Davies looks for running room in a game against visiting Galion last fall.